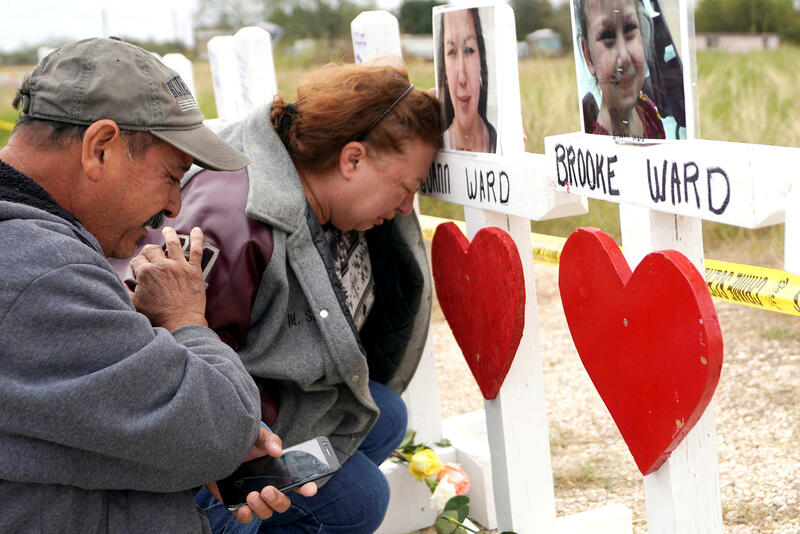 SUTHERLAND SPRINGS -- Two silver hearses carrying the bodies of a couple killed in last weekend's shooting at a Texas church were followed by a long procession of vehicles Saturday that avoided passing the small church where more than two dozen people died. Texas gunman Devin Kelley's ex-wife says he "had a lot of demons"
The gunman killed 25 people -- authorities put the number at 26 because one was pregnant -- and wounded about 20 others. The gunman died of what appeared to be a self-inflicted gunshot wound after being shot and chased by two men who heard gunfire from the church. The church's steward Rod Green and his wife Judy had run-ins with Kelley before the massacre, CBS News Omar Villafranca reports. "He was a very evil person. A very crazy person," Rod told CBS News. "His actions were sporadic. He bragged about being armed." Villafranca reports that when Kelley showed up to the First Baptist Fall Festival last month, Rod kept an eye on him looking to see if he was carrying a gun. Judy remembers being alarmed because Kelley had a strange, vacant look. "I was scared for all our family and all the people there within the hall ... and I was praying, 'Don't let anything happen,'" Judy said. Villafranca also met Mike Ritch -- in nearby city Adkins -- who helped his fellow Texans after Hurricane Harvey devastated the state. When the unthinkable happened in Sutherland Springs, Ritch didn't think twice about volunteering in the aftermath of the shooting. "When disasters strikes or a tragedy happens, you have two choices," he told CBS News. "You can either sit around and wait for help to arrive or you can roll up your sleeves and make it happen ... we rolled up our sleeves." Adkins held a barbecue to benefit Sutherland Springs. Villafranca says people from as far away as Georgia and Washington were helping the community. Organizers say 100 percent of the proceeds will go to the victims' families and the church. Sutherland Springs is about 30 miles southeast of San Antonio and not far from several military posts, including Lackland Air Force Base. The Air Force's chief of staff, Gen. David Goldfein, said 12 of those killed were either members of the Air Force or had family ties to it.